Happy Friday! Today's Feature Fridays comes from Michelle Tucker from Baby Blues to Running shoes, which a great name and suits her journey perfectly. She was able to overcome her postpartum depression and regain her health with running. Now she is a healthy mama and marathoner! Read on for more about her journey! I wasn't always overweight. I had a pretty average childhood and was pretty active with softball so when I started gaining weight my senior year of high school I had no clue what to do. The weight gain continued through college and my 20s. By the time I got married and pregnant several months later I was 219 pounds and 29 years old. I took "eating for two" literally. My son was born in December of 2008 and that is really where my story begins. I struggled with postpartum depression from about the time Colton was 2 months old. I didn't care about anything unless it involved my son. The last thing I cared about was myself or my health. I probably weighed around 250 pounds. My husband was desperate to help. He had been a runner and suggest I try running. The first time we went out together to run I couldn't make it from one mailbox to the next. But, the next day I tried again and made it to the next mailbox. I'll never forget the first time I ran a mile in our neighborhood. I felt unstoppable! I signed up for a 5k and loved every second of it. but most importantly every day I was feeling more and more like myself. I felt like I was literally running away from my depression. Along the way I noticed that I was starting to lose weight . As I noticed the changes I began to make other small changes in my daily habits. I would drink more water, or cut out fast food and slowly the weight came off. I have now lost 70 pounds and have about 10 left to my goal weight. 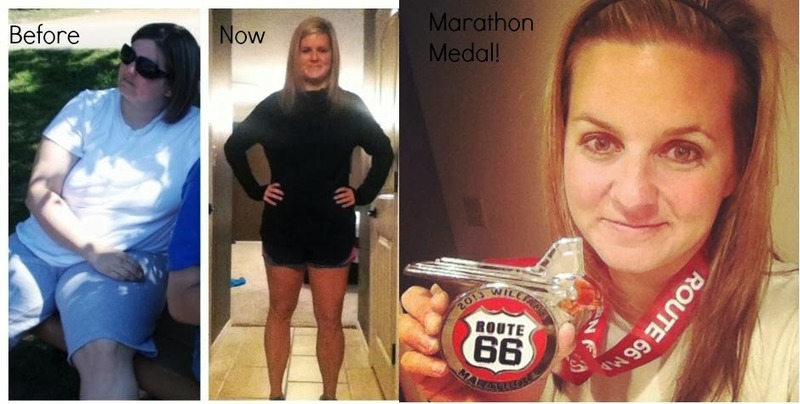 I've ran many half marathons and ran my first marathon this past November. That was by far my proudest moment in this whole journey! Running keeps me motivated to maintain my weight loss. I know if i fill my body with junk I will feel absolutely horrible when I go out to run! If I eat healthy and stay on track then I feel amazing when I run. Exercise has been a huge part of staying motivated for me. Running helped me with my postpartum depression and it still helps me live a healthy lifestyle. My biggest tip would be to start out small. If you are looking to start a weight loss journey decide that this week you will drink more water or eat a healthy breakfast. It becomes so overwhelming when we try to do everything all at once. Weight loss is a lot like running. You can't start running and run a marathon the next day. They both take training. If you break a healthy lifestyle into small manageable steps then it is much easier to succeed. I am a 35 year old stay at home mom. I've been married to my amazing husband for 6 years and we have a 5 year old son. I spend most of my free time training for my next race and I love being outdoors with my family! I want to thank Michelle for sharing her personal story with us today. It is so inspiring to see a mom over come postpartum depression with exercise. Please make sure to stop by her pages and like and follow! Also, hop on over to her blog and stay motivated while she shares her training journey! She is a awesome example of how eating healthy and exercise can change your life. What's Been Cooking in My Kitchen!